The Photovoltaic Solar System on December 2nd 1971: The Day of Birth of the United Arab Emirates. The project is an artistic interpretation of the Solar System as well as an ideal symbol of the United Arab Emirates: the position of the planets corresponding to the configuration of the Solar System on December 2nd 1971, the day in which the United Arab Emirates were founded. 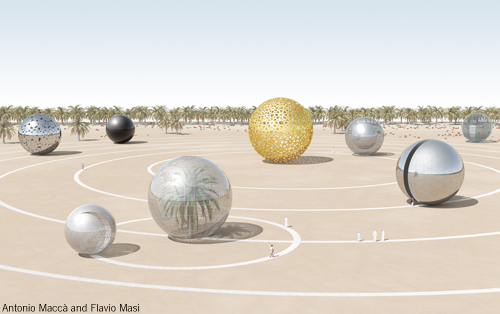 The environmental installation is a metaphor of the Seven Emirates, represented in form of a Sun with six planets guided by the spiritual sphere (the Crescent): in a work that ideally puts art at the disposal of the history, both past and present, of the Country it aims to celebrate. 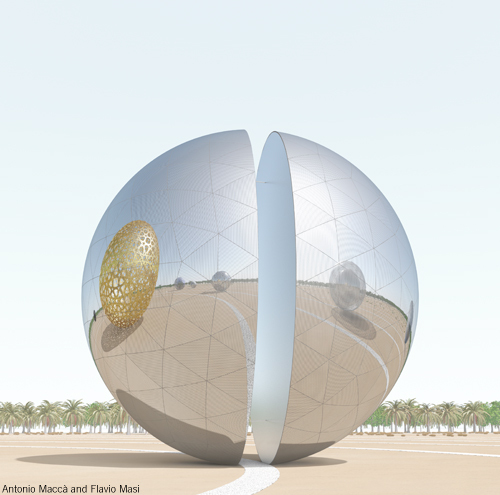 The artwork is also meant to create a new iconic sun for the City of Abu Dhabi: the astronomic Sun radiating energy to the new photovoltaic sun, which will generate light and electric power for the future urban area of Masdar. The PV sun works as the attracting element and symbolizes the unity and infinity of the cosmo: the endless geometrical pattern of the golden surface, with its timeless perfection and purity, represents the starry sky and creates a spherical motif of both light and shade, thus dematerializing the sun and emphasizing its transparency. The PV sun is to be completed by means of LEDS that will light up its skin throughout the night. The project suggests a contemporary landmark defining a unique relationship between nature, art and science. It is structured as a scheme made of circles that defines the entire area according to one single principle. The almost concentric traces, drawn with natural stones on the land, symbolize the orbits described by the planets around the Sun and will be easily recognizable from great distances, also by the landing planes of the nearby airport. The land artwork is positioned in the plane barycentric area of the almost triangular site, with the largest trajectory tangential to the boundary limits of the roads, thus establishing an optimum relationship with the surrounding open spaces. The static concentric structure of the project is vitalized by the planets, ideally seeming to roll all around the site on the orbits, thus creating a complex of dynamical sculptures. The spheres are all different, varyingin structure, dimension, colour, transparency degree and photovoltaic technology. The dimensions of the planets will depend on construction costs and on the required amount of energy to beproduced. The Earth is the only place in the universe where life is known to exist: life on earth is therefore symbolized by an already existing tree,around which will be constructed a photovoltaic greenhouse with the serigraphy of the continents. The Moon, its satellite, is endowed on the surface with an opening in shape of a Crescent. The founding conceptsfor the other planets are suggested by astronomic phenomena, such as: the presence of atmosphere in a planet for the double concentric spheres, the impact craters on the surface for the sphere composed by circles, the ring system for the split globe, the cloud bands of a gas giant for the photovoltaic solar shading sphere and the eclipse for the black planet. The planets, like pavilions, can host entertaining and educational facilities, such as temporary exhibitions or public activities, in order to create a new place of collective identification and a fascinating cultural site. In this way, uniting the rationality of the concentric orbits with the multiplicity, the differentiation and the interaction of the planets, the art installation will become an open system in dialogue with the environment. The structure of the complex will offer a flexible constructive system, composed by geodetic steel structures to which photovoltaic panels will be applied. The installation is a representation of the Solar System composed by photovoltaic solar systems. It will capture energy from the sun and convert it into electricityusing innovative typologies of polycrystalline thinfilm photovoltaic technologies: thin film with an active layer of copper, indium, gallium and selenide (CIGS) and thin film solar cells with multycrystalline silicon (mc-Si). The photovoltaic panels are different for each planet, according to their different materials, shapes, colours and textures. They have maximum outputs even in high ambient temperatures and with diffuse light, and convert all the surfaces of the sculptures into energy generators.